Let no-one under-estimate the significance of success in the play offs in terms of helping to transform the fortunes of a football club and driving change. Nowhere is there a better example of this than Bradford City’s first Wembley final in 1996, an event that gave a new momentum to the Bantams and which culminated in promotion to the Premier League three years later. A repeat victory at Wembley this month could be equally significant for the destiny of the club, not necessarily leading to the ultimate promotion as opposed to consolidating the progress that has been achieved at Valley Parade. With the benefit of hindsight the 1996 final should be recognised for having been hugely influential in shaping the future of Bradford City and marking a break with the past. Until then, what happened at Valley Parade had been largely impervious to the Premier League revolution and its wide-reaching impact on English football. But in 1996 it felt as though a dam had burst such was the acceleration of change and the fairly radical transformation of the experience of supporting the Bantams. In my opinion there are three themes which illustrate the contrast pre and post-1996. First and foremost was the extent to which the play off final captured public imagination in Bradford. The second was the way in which the club capitalised on the new found enthusiasm through commercial activity and the retailing of merchandise. The third was the impetus given to online engagement and the use of the internet by supporters to keep in touch with what was happening at Valley Parade. An estimated 28,000 fans travelled to Wembley to see the play off final with Notts County on 26 May, 1996. This number exceeded those from Bradford attending the FA Cup Final (at the Crystal Palace) and the subsequent replay (at Old Trafford) in 1911 estimated to have been 15,000 and 10,000 respectively. The attendance at Wembley in 1996 was disclosed as 39,972. In 1996 it was truly a carnival gathering, the likes of which no-one had previously witnessed whilst following the Bantams. A measure of how much the event meant to Bradfordians could be gauged by the extent to which they outnumbered and out-sang those from Nottingham. The final gave City followers their first experience of a truly big-match experience but the match was also significant for its live TV coverage, at that time a unique occurrence for Bradford City. In May, 1996 it was the club’s first ever visit to Wembley, an occasion not to be missed. Yet it was more than simply a football match and what was remarkable at the time was the way in which it captured public imagination. It was not just the number of family groups who travelled to Wembley that made it unique but the enthusiasm and goodwill among people who would have previously shown no interest in football, let alone Bradford City. In the build-up to the game there was a shared anticipation throughout the district and a reminder of what it must have been like in the four weeks leading to the FA Cup Final on 22 April, 1911. The excitement building up to the play off final in 1996 was all the greater for the manner in which the club clinched its play-off place on the last day of the season (the culmination of a run that saw the club win nine of its final twelve games) and the semi-final victory over Blackpool in which a 3-0 victory away from home in the second leg reversed a 0-2 reverse in the first leg at Valley Parade. The celebrations in response to the 2-0 victory over Notts County were genuinely community-wide even if there was no repeat of the reported one hundred thousand people who thronged the city centre in 1911 to greet the FA Cup winners. An open-top bus tour allowed the Bradford public at large to acknowledge the winning players and for the first time that I can remember, the team was feted as heroes and ambassadors of the city. In the immediate aftermath there was a tangible feelgood factor in Bradford. The experience secured a new generation of supporters and revitalised the enthusiasm of others. The manner in which the team had secured its play-off final place had also inspired supporters and instilled confidence about what could be achieved and the legend of the play-offs sustained the self-belief of fans which proved invaluable the following season when the Bantams fought to preserve their new found league status. People were also keen to replicate the Wembley atmosphere at Valley Parade which translated into a positive, buoyant mood on match days. The number of replica shirts worn at Wembley marked another profound change. Chairman Geoffrey Richmond identified the opportunity and exploited it with abandon, pushing the boundaries of good taste and there was no limit to the range of products that were offered to supporters with a BCAFC crest applied to them. The arrival of a portacabin on the Valley Parade car park in May, 1996 marked the start of his retailing adventures at Bradford City with a subsequent explosion of club merchandise that ended with the Upfront megastore in 2002. It was a phenomenon in common with larger clubs and by the start of the following season there was an infusion of colour to the stands and a good proportion of supporters wearing claret and amber clothing. Until then it was the case that replica shirts were worn principally by children but the Wembley experience changed those norms. It was a sign of the times and the Euro ’96 tournament similarly made the wearing of England shirts fashionable that summer. For football clubs looking to exploit new sources of income, merchandising was heaven sent and by the time of our promotion to the Premier League in 1999 City had gone in for it in a big way. It was not simply that new retail floorspace was opened, the ticketing arrangements allowed the club to capture a valuable database of customers that opened up further opportunities for revenue generation through mail order. For the start of the 1996/97 season for example the club published a 16 page catalogue of merchandise for the new Bantams Leisure retail operation. Much of the clothing range, including the playing strip, was manufactured by Beaver International. Not only was retailing revolutionised, so too was the club’s commercial strategy that targeted local businesses for sponsorship and support. 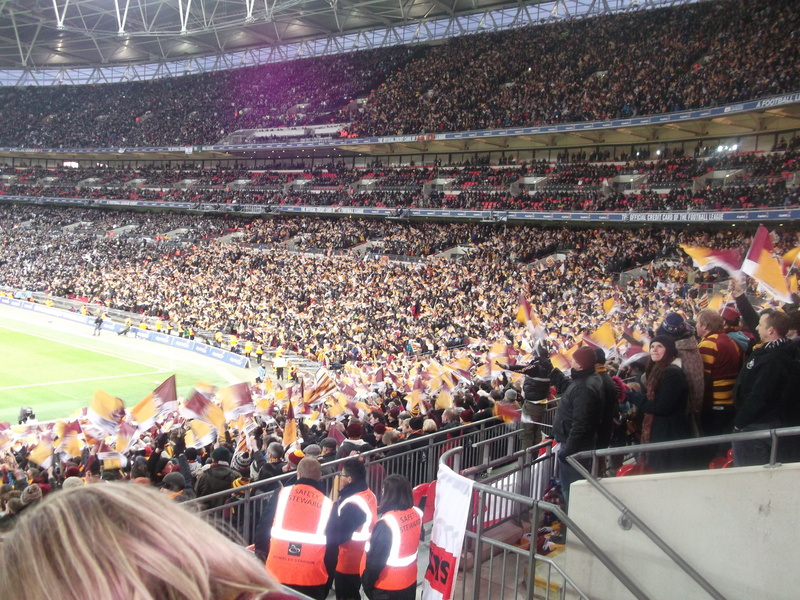 The prospect of Bradford City playing at Wembley for the first time caused considerable excitement among exiled supporters overseas who were keen to follow the build-up to the big day. 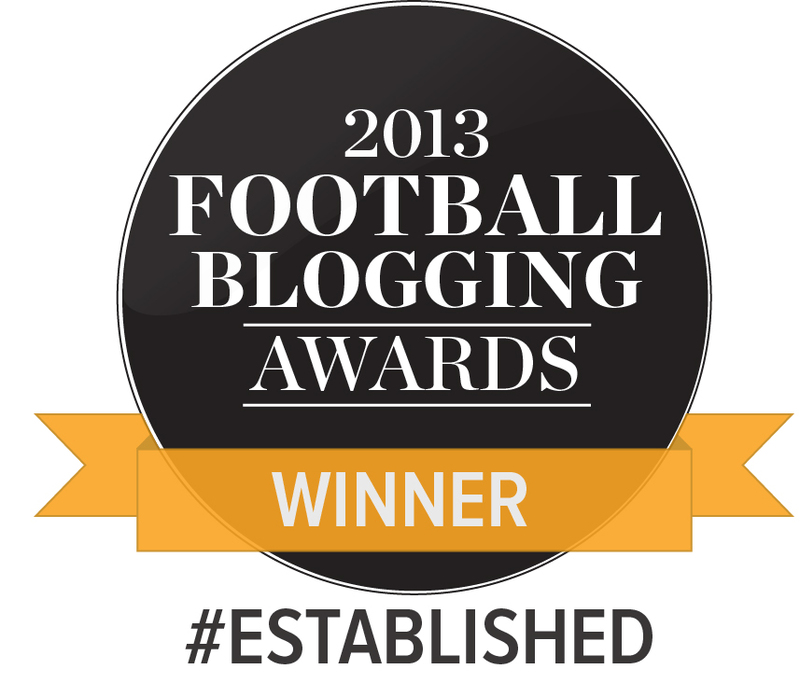 I believe that the play offs had an important role in giving a boost to the internet connectivity between supporters and for the first time there was a sense of a global Bantams community proud to identify with their home town club. Notwithstanding, even in 1996 the vast majority of City supporters were offline. Nowadays it is taken for granted that you can readily access news about Bradford City on a 24/7 basis and maybe we under-estimate how the internet has transformed the supporting experience. In fact the changes in news provision from Valley Parade have been dramatic in the era that began with the return to Valley Parade in 1986. The launch of the City Chatline in 1988 had been considered the essence of modernity, allowing supporters to access news about the team through a premium line phone call. This later evolved to become Team Talk and then Bantam’s Banter with the service advertising ‘all the latest news, views, featured interviews and match reports’ via the telephone. Just over twenty years ago the internet was still in its infancy and few people had a PC at home, even fewer access to the world wide web. It should be mentioned that in 1996 the Bantam’s Banter phone line remained the principal source of news for remote fans, hardly an option for someone based abroad. It was during the latter stages of the 1995/96 season that around fifty City supporters from across the globe established a mailing list that allowed them to stay informed about the club’s progress towards a first ever visit to Wembley Stadium. As I recall, former full back Brian Mitchell was one of those members. The claret and amber internet network was formalised as the Internet Bantams in 1997. However the exchange of news was via email rather than a message board as such and it was not until 2002 that the club established its own official message board. The City Gent website was launched in 1997 and by the end of the decade there were at least three other independent City-related websites in existence. At the time of promotion to the Premier League in 1999, the only clubs who didn’t have an online presence were Bradford City and… Liverpool (!) but by 2000 this had been remedied with the launch of an official club website. How will we remember May, 2017? Whereas the occasion in 1996 was significant for its influence in bringing change to the club, I believe that this time the final will be remembered for consolidating the progress that has been achieved in the past five years. We are hardly strangers to Wembley and the game should be a reaffirmation of the good times that have latterly been associated with the club. There is no reason why victory in the 2017 play off final should not endow the club with the same feelgood factor as in 1996. Above all, I believe that there is a strong sense of destiny and that 20 May, 2017 will provide Stuart McCall the opportunity to deal with ‘unfinished business’. Hopefully that is how history will record events but either way I am confident that this year’s play off final will be remembered as a landmark occasion, just as that 21 years ago. I don’t know about everyone else but I was always more excited about going to the Old Wembley rather than the New Wembley. The new Wembley doesn’t have that something that the old one did. Lovely article John, thank you. I remember the excitement in 1996 after that unbelievable 3-0 victory at Bloomfield Road provided Bradford City with their first opportunity of competing at Wembley. 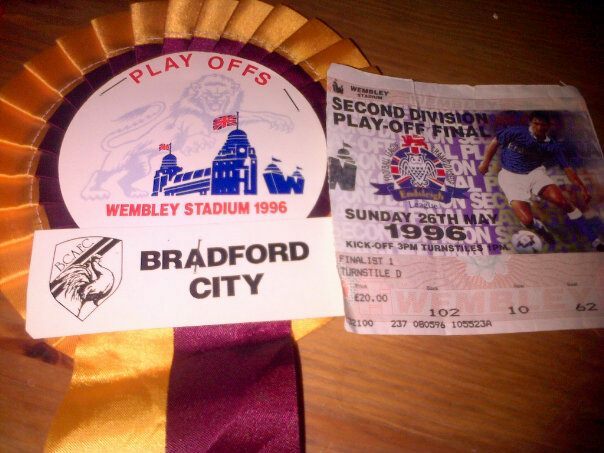 I had only been supporting Bradford City for eight seasons in 1996 and after six seasons in the third tier of English football, the 1996 play off final was my first ‘big’ game supporting Bradford City as I’d not attended the play off games against Middlesbrough. 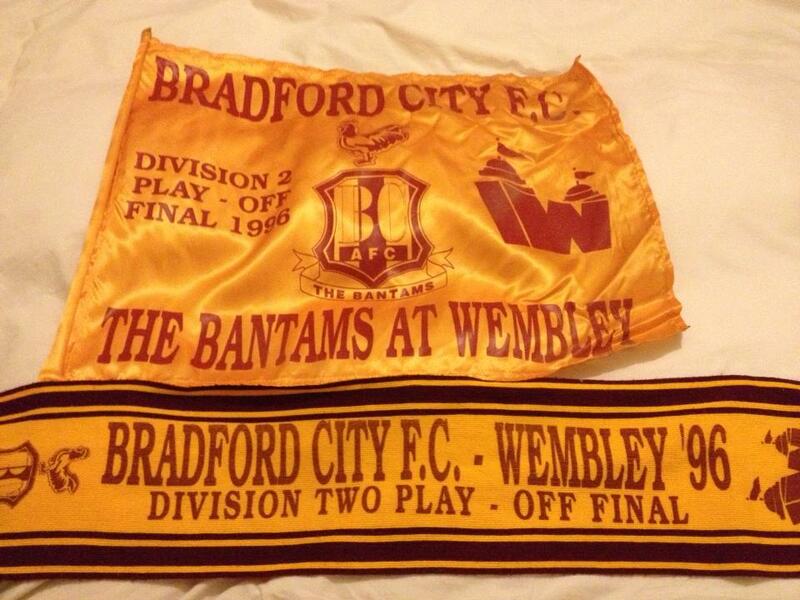 I was speaking with a Bradford City supporting friend last night who will be with me this Saturday and who was also with me at Wembley in 1996 and for our two visits in 2013. We both agreed that although this Saturday will be the fourth time that we will have seen our beloved team play at Wembley, we are still as excited as in 1996, maybe more so as his son (my Godson) will be supporting Bradford City for the first time at Wembley this Saturday.